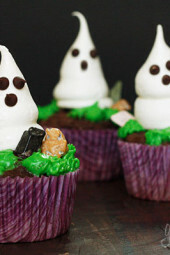 A few great scary Halloween additions to these Meringue Ghosts are Spooky Spider Cupcakes, Frozen ‘Boo’-nana Pops, Chocolate Mummy Cupcakes and Skinny Mummy Cake Balls. I have so many of these ghosts in my home I started naming them! Each one has it’s own personality and character, aren’t they just so cute! They’re great as a cupcake topper or can even be kept as cookies. 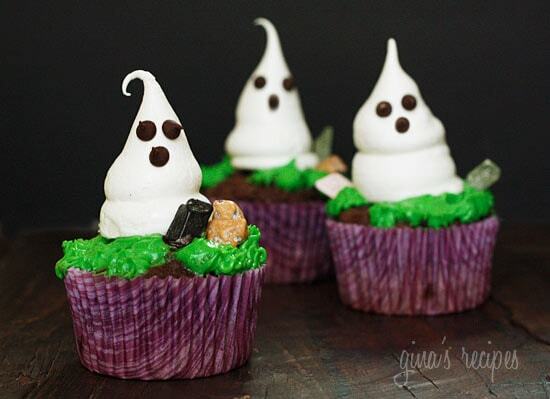 This recipe was from the Joy of Baking, but I’ve been seeing these ghosts popping up all over the place lately. The original recipe states it makes 24 ghosts, but I made several batches and each time I got around 36 ghosts. As I’ve mentioned in my other meringue recipes, they key to successful meringues is to make sure your bowls and spatulas are squeaky clean; metal bowls are recommended since plastic can hold traces of grease. The eggs should be room temperature, so leave them out at least 30 minutes before you are ready to begin. Have a pastry bag fitted with a 1/2 inch plain tip. 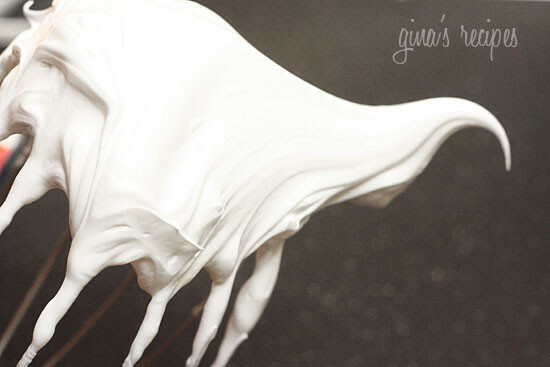 In your mixing bowl, using the whisk attachment, beat the egg whites on low-medium speed until foamy. Add the cream of tartar and continue to beat until you get very stiff peaks. Transfer the meringue to the pastry bag. Holding the bag perpendicular to the baking sheet, pipe with even pressure, 2 inch high mounds of meringue. 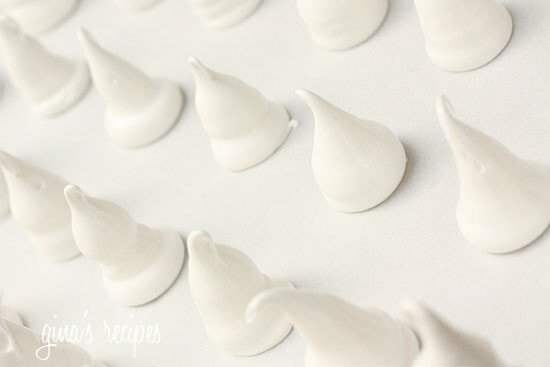 Bake the meringues for approximately 1 1/4 – 1 1/2 hours or until they are dry and crisp to the touch and easily separate from the parchment paper. Turn off the oven, slightly open the door, and leave the meringues in the oven to finish drying several hours, or even overnight. *Smart Points does not include the eyes. Modified From Joy of Baking. Oh my goodness, I love these so much!! So fun and delicious! I made a batch with the door closed and I wasn't happy with them. I forget exactly why, I made them like 6 times before I posted them. 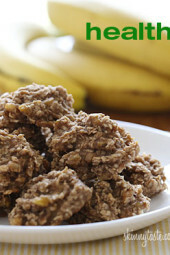 I made these today and they are a big hit! My teenage daughter is going to take them to school to all her friends tomorrow. I have a question though – all the meringue recipes I found on the internet say to leave the oven door closed overnight with the heat off. Wouldn't that be better than propping the door open to prevent any moisture from reaching them? I also used powdered vanilla 1/4 teaspoon. (it is brown in color) and it didn't discolor the mixture. My ghosts are just as white and the vanilla flavor is outstanding! Kelly thanks for the laugh! I decided to try this as the first use of my shiny new stand mixer. I'm thinking, as I have not baked in yeaaars, that I probably should have started with something a tiny bit easier. I had semi-stiff peaks. I'm not sure if my timing was off or I didn't beat my eggs enough/over beat them. Not all is lost! They were able to keep their shape somewhat so now instead of ghosts I have ghost turds. Knowing my friends, I think they'll like them even more than the actual ghosts. I'll try again for ones to bring to work and see what happens. Either way, I had fun trying. I made these today and was surprised at how easy they were! I doubled the vanilla and they were delicious. It takes a little practice to pipe them and they were not as cute as yours, but still plenty cute. I used a tip in a plastic food bag. Just the bag would have worked too. Thanks Gina! Cant wait to make them! They look sooo adorable and yummy. They look like cute little ghosts to me. People make big deals out of minor things…Love ur work Gina! Thanks! Gina, these are ADORABLE. I work in a bakery and as soon as I saw these meringues, I knew other people had to see (and eat) them too. For the past few days, I've been baking cupcakes, tarts, and cakes and putting these little guys on everything. Everyone loves them (and we've gotten several special orders that include them). I thought you should know how much people love these cute little ghosts! And, for the record, I really do think they look like ghosts (and not something else). I love how each one ends up with its own personality. Thanks for the great idea! Stephanie, sorry to hear that, don't feel bad, meringues are tempermental! My meringue ghosts were a fail… 🙁 I just can't get this baking thing down! They had stiff peaks before putting them in the bag but by the time I piped them out they just ended up being big blobs. Oh well work is getting meringue blobs with chocolate chips! They will never know! I'm Latina, so I would certainly not have klansmen on my site. But for those of you who thought they didn't look like ghosts, I changed the photo, added a third chip for a mouth and deleted the other image. I was at the pumpkin patch yesterday and I saw many ghost decorations shaped similar to mine, clearly these are ghosts as I mention in the name. I changed the photo to cupcakes I had created a few weeks ago with a graveyard using chocolate rocks and some grass icing to go with the Halloween theme. Really cute, and seriously, how does anyone know what a real ghost looks like? And who would make little meringue klansmen? A nice light Halloween treat! I get that they are ghosts, but they really look like the KKK. Maybe add food coloring so they are "fun, fall colors" instead of white? Could I add extracts to make strange fruit flavors? my kids are going to absolutely love these! Just a short question: did you use round chocolate chips? If yes, where did you get them? I just made these and for a first time Meringuer they actually look really cute. A little too swirly, like an ice cream cone but not too bad for my first baking experience! 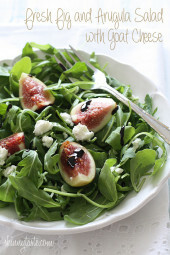 Great recipe! Beatriz- As long as you buy the tip, it would be ok, but you should splurge and buy a set if you like to bake. Naomi, it should work, make sure it's super clean. No, confectioners sugar is too fine. You can just put the sugar in the magic bullet or food processor. someone said they would look less "KKK" if you add an O mouth 🙂 Very cute idea tho! Is fine sugar the same as confectioners? Thank you….they are so cute!!! I don't have a stand mixer (yet) and my hand mixer only has the beaters…will it not work? I made meringue cookies last year but added mint extract. SO yummy. I wish my mixer had a whisk attachment, it took forever with the regular beaters! OMG! This is sooo cute, so adorable. I loved it. These look great! Perfect because I'll probably have to bring treats into work during October. I love these!! I would be thrilled if you'd like to link up to my Wickedly Creative Halloween Ideas Party. *Sigh* I think they look like ghosts. The chocolate chips don't melt as you can see in the photo. I'm not home so I will have to check what number that tip was. They sell dark vanilla, that would discolor them, which is why I mention to use white. 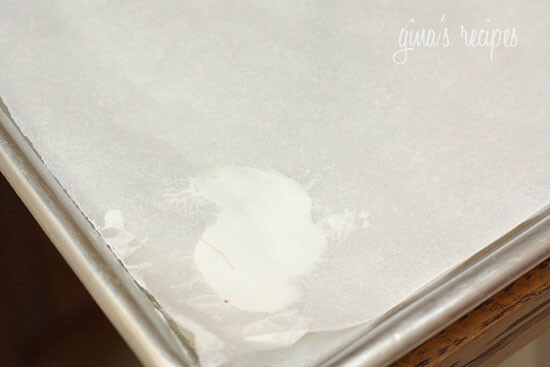 The vanilla can go when you add the cream of tartar. Sorry for the confusion! LOL! These are so cute and my family absolutely love them… Thanks! How cute so amazing idea that we eat Meringue ghost. I LOVE this idea! They are darling and a perfect Halloween treat. These are so cute, can't wait to make them! Adorable. What a cute idea. Can you use Splenda instead of sugar to cut on calories? These are too adorable! I can't wait to make them for my Halloween party Gina! I love meringues! Did you have nay problems with the chocolate chips melting while the meringues were in the oven? This is so cute and os easy; Love it Gina! Had a question about the pure white vanilla extract. will using regular vanilla extract discolor them and is white the same thing as clear vanilla extract? Can't wait to make these for my office. My last experience with meringue didn't work out, but I think that recipe didn't call for cream of tartar. Question, does the vanilla go in after the cream of tartar or after the sugar, it's listed twice. Thanks!!! Oops, thanks for noticing, I just added the sugar step in the directions. 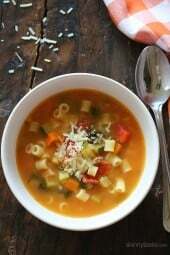 Hi Gina, thanks so much for this wonderful recipe that I am going to use to send with my kid to school for his birthday. QUESTION: do you put the sugar in at the beggining with the eggs? Goodness, these are cute. Love them! I just made these (a very similar recipe, slightly different method) for my colleagues at work! Halloween came a bit early for us this year. How cute! I'll definitely whip some of these up for Halloween. Those are too cute! I'll make them with my nieces, I'm sure they would have fun with that! You never cease to amaze me! Thank you, I LOVE your site!! So cute! My kids are gonna love these! You never say when the sugar should be added. Is it with the egg whites? These are absolutely adorable – very different too!